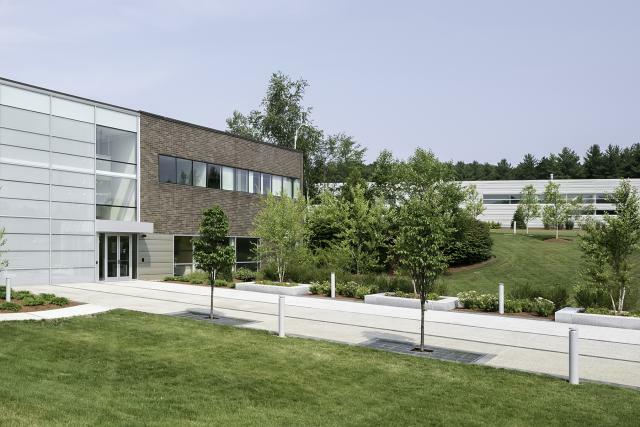 The AIANH Excellence in Architecture Awards Program was instituted in 1983 for the purpose of providing public and professional recognition for architectural projects of design excellence by New Hampshire architects. Each entry is judged on the following criteria: overall design excellence including aesthetics, clarity, creativity, appropriate functionality, sustainability, building performance, and appropriateness with regard to fulfilling the client's program. Scroll below to see the results of the 2017 program. The 2017 jury was comprised of architects from the state of South Carolina. They were Jane Frederick FAIA, Kate Schwennsen FAIA, Earle Hungerford AIA, and Tom Savory AIA. General Contractor: Naylor and Breen Builders, Inc. 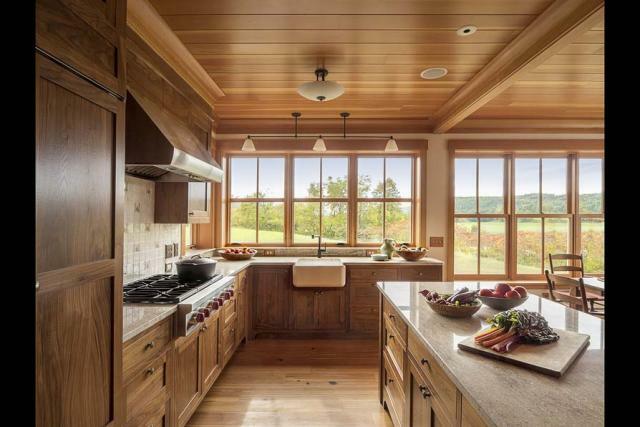 Located on the banks of the Connecticut River, this 4 bedroom home was designed to capture the character of a New England farmhouse and was sited to preserve as much farmland as possible while providing views up and down the river from the principal rooms. The house and barn define an outdoor room that frames a visitor’s view across the river to Vermont. 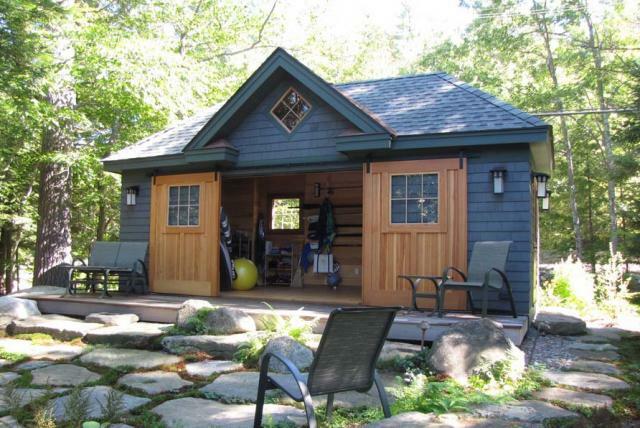 The barn contains a studio apartment, office, workshop, boat room and equipment storage. The rooms in the house are modest in scale and the layout is informal. The energy performance of the house approaches net zero. Civil Engineer: TF Moran, Inc.
Structural/Mechanical/Electrical,Plumbing/Fire Protection Engineer: Rist-Frost Shumway Engineering, P.C. Landscape Architect: Carol R. Johnson Associates, Inc. 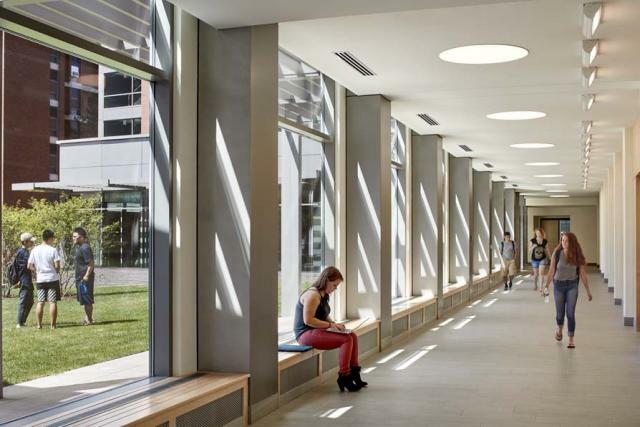 The new 50,000 square foot Library, completed in September 2014 with a construction cost of $20M, sits at the heart of the 300-acre SNHU campus in Manchester, NH. 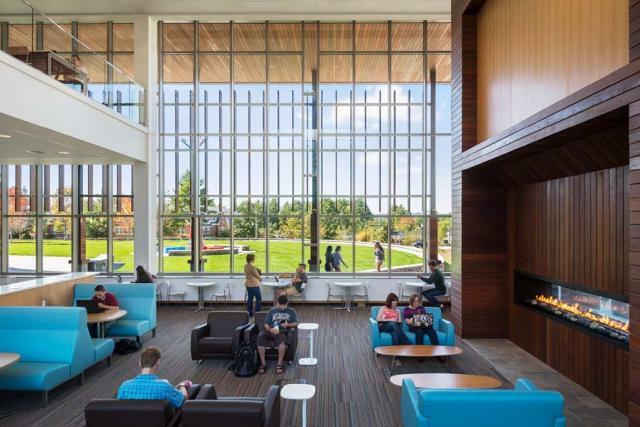 The main goal of this project was to create a signature building that would communicate the centrality of academics and position the learning commons at the crossroads of the student experience. The building’s massing is articulated to maximize solar exposure of this gathering space, ensure transparency from outside and from within, and exploit the fine views to the surrounding woodlands. Contextually, materials were deliberately selected for their regional association and durability. 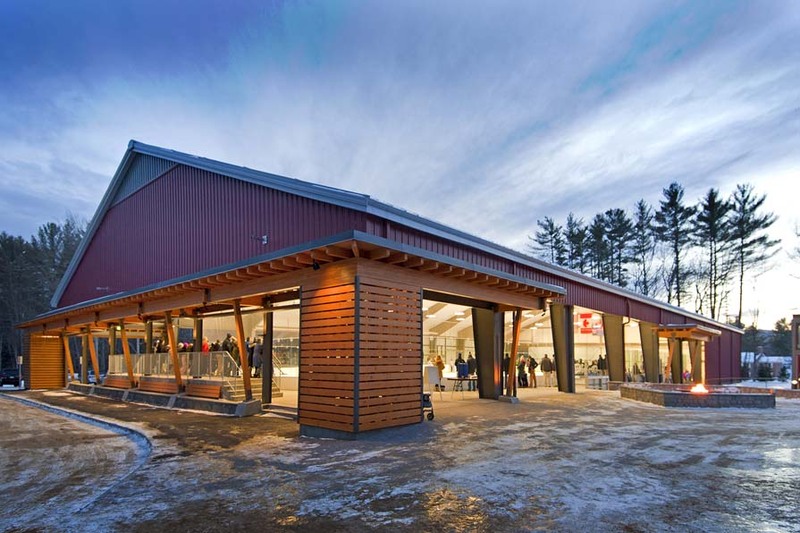 New Hampshire Granite and Ipe wood, an incredibly hard, dense, sustainably harvested wood, outfitted the project. 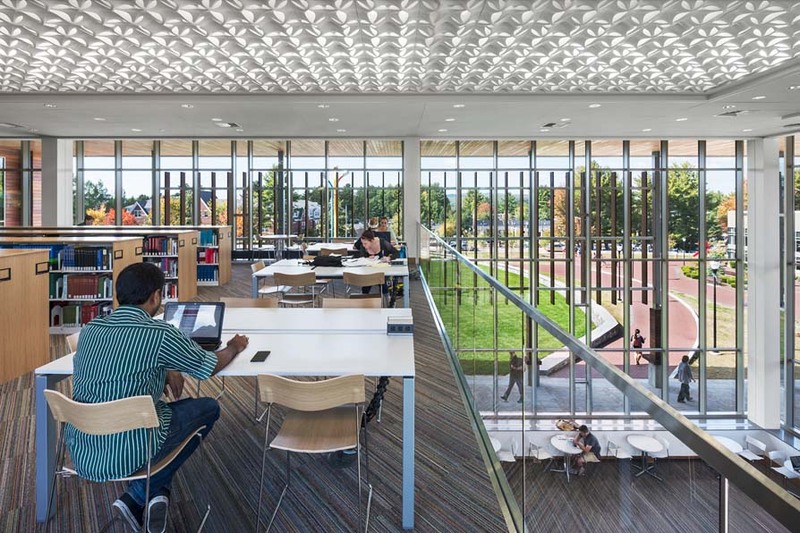 The programming phase identified a mixture of learning spaces, including collaborative, social, and solitary typologies as well as many partner programs These programs are seamlessly integrated within the ‘library learning’ programs. Jury Comments: The jury was initially drawn to the clarity of this project’s plan, which tracks through in the building massing, and is further articulated in the skin and glazing. 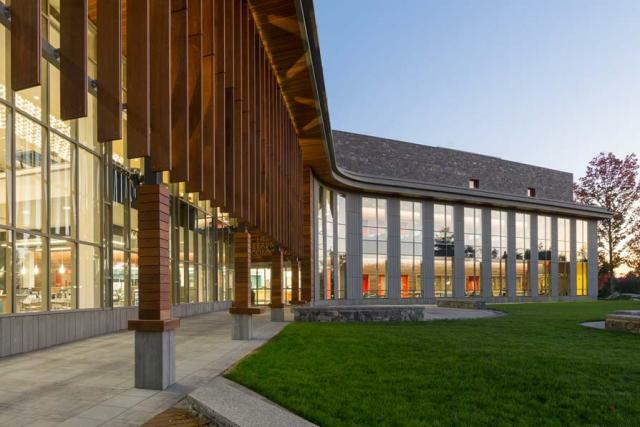 We appreciated the simple choice of two primary exterior materials – granite and wood – and how they interact, with the wood revealing itself from behind the granite façade. The way in which these materials, and the glazing, are tied together through a consistent, playful rhythm is also delightful. We loved how the two primary entries, to the library and to the café, are expressed as penetrations through the wood, signaling warmth upon arrival. This theme is further reinforced with the concept of the hearth embedded in the wood, expressed intimately on the interior and monumentally on the exterior, at the fabulous big wood-lined porch. Several jurors commented on how bright the interiors are, a function of the thin plan; those of us who have lived years in colder climates know how important natural light is in the winter, and how nice it would be to spend time in a building that is as fully penetrated by daylight as this one is. One of the jurors also commented that the whole building is a well-integrated solar study, from the composition of the west façade, to the gentle curve allowing western light to rake the façade and the porch, and the wood fins that simultaneously define the entry colonnade and function as sun shades along the café. 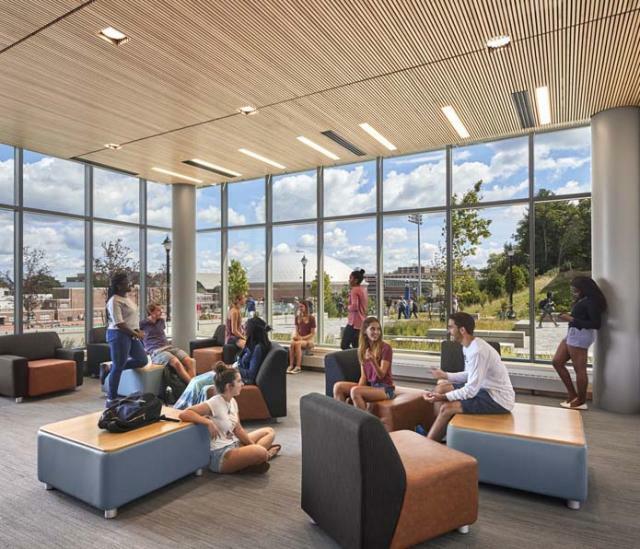 The Keene State College Living & Learning Commons is a first-year resident hall and the school’s first Living-Learning community. The project is a Gateway connecting the east campus entry on Wyman Way to the east/west axis of the Appian Way and the future development zone which includes the Redfern Arts Center and the Visual and Media Arts Center. The project arranges the building blocks of the Residential Learning Community to form a unifying landscape for this precinct of campus by organizing them into 3 wings plugged into a vertical social hub. The wings define 3 distinct landscape experiences- arrival, contemplation, and gathering. The vertical Hub becomes a landmark for visitors arriving from the east and puts the living & learning activity on display. 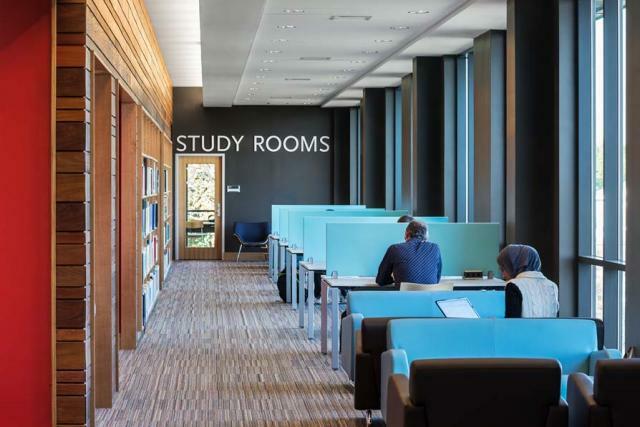 Study lounges at the end of each wing help anchor the building to prominent paths, and ground floor lounges and classrooms invite in the larger campus community. Jury Comments: The jurors all agreed that this was a beautiful project, beautifully presented. As is probably obvious by now, a common theme for our jury was “restraint,” which this project exemplifies. At the same time it exemplifies another favorite theme: “playfulness.” It is both restrained and playful. Several members of the jury remarked that the core success of the design lays in its central feature, which the architects have called the “Hub,” a three-story vertical social space that engages three simple wings, each in a different way. And these wings, in turn, efficiently define outdoor space, tying the building into the campus context. The energy contained within the Hub also creates a type of ripple effect that subtly makes its way across the facades of the wings, culminating in sculptural outbursts at the ends. While, in plan, the building is deceptively simple, the soul of the design is revealed in section, specifically in the section through the Hub. It is a reminder of the lesson we all learned in school, that section is a powerful way to organize space. 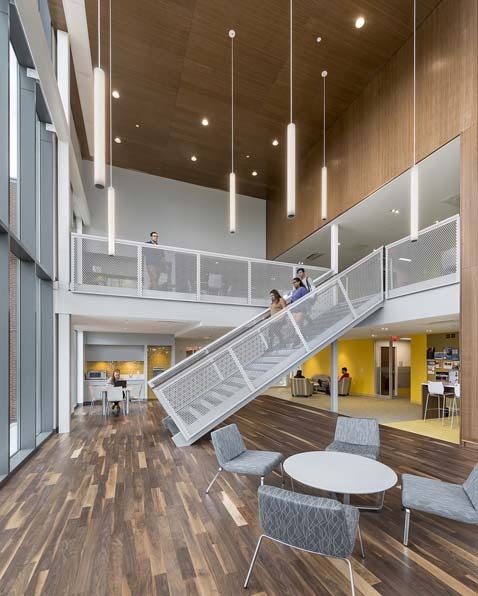 Space is also modulated in section to encourage students to use the stairs, with events and moments along the way, in a way that makes it easy to imagine them actually climbing all five flights of stairs. The jury also loved the subtly playful fenestration patterns and was particularly impressed with the way in which function was sculpturally expressed in building massing. General Contractor: Phil A. Douglass Inc. 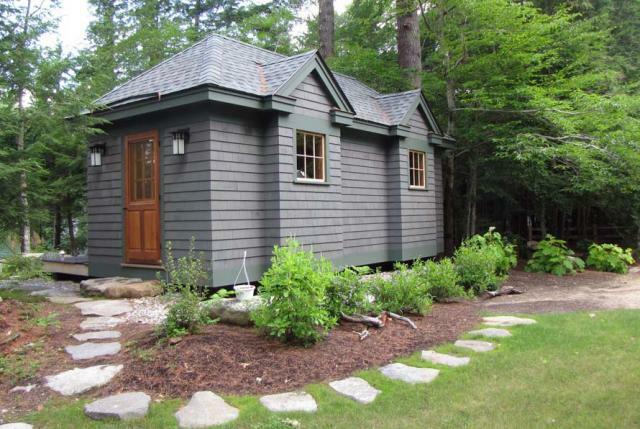 This newly constructed Maine cottage was built within the confines of a previously razed camp which was located within close proximity to the water’s edge on a sizable lake in southern Maine. 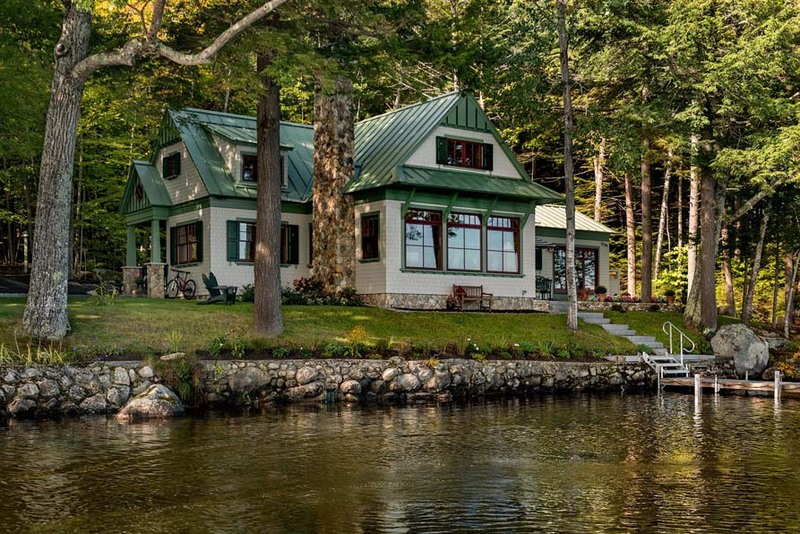 The owners’ goal was to design a comfortable, casual Maine woods style cottage that reflected its natural lakefront setting. 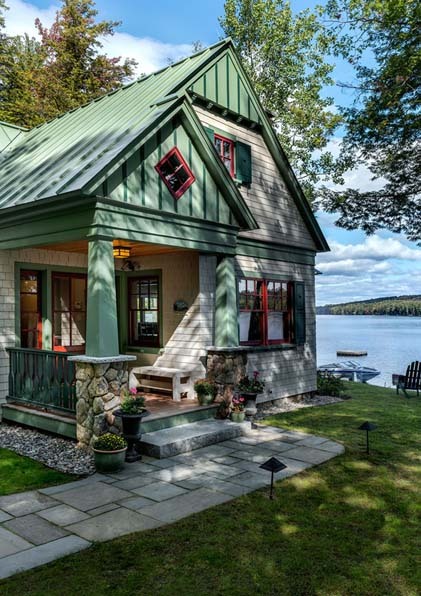 The architectural character and detailing of the home replicates the historic architectural elements found in many of the turn-of-the-century cottages throughout this lakes region of Maine. 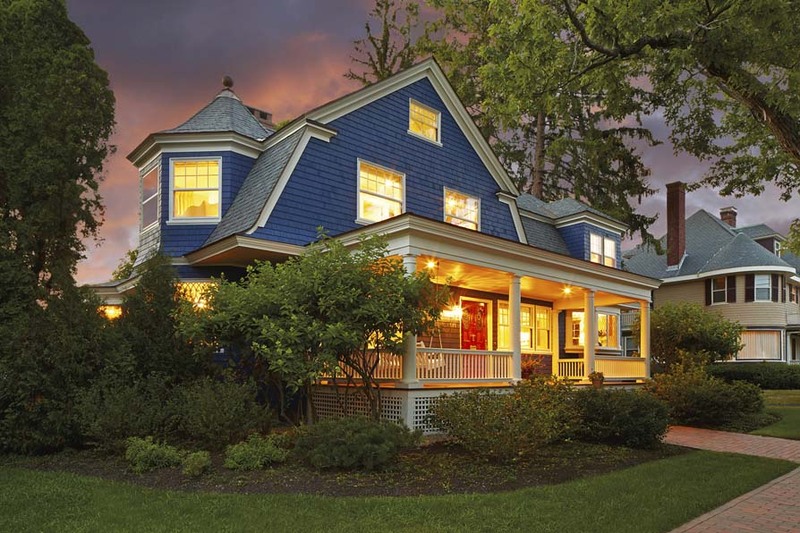 The exterior of the house is capped with a playful combination of hip and gable roofs. Clad with standing-seam sage green metal roof to blend into the site’s natural forest setting, the stone central fireplace chimney grows out of the fieldstone-veneered foundation and becomes a visual focal point for the living room along with the panoramic view seen through a series of large picture windows to the lake beyond. 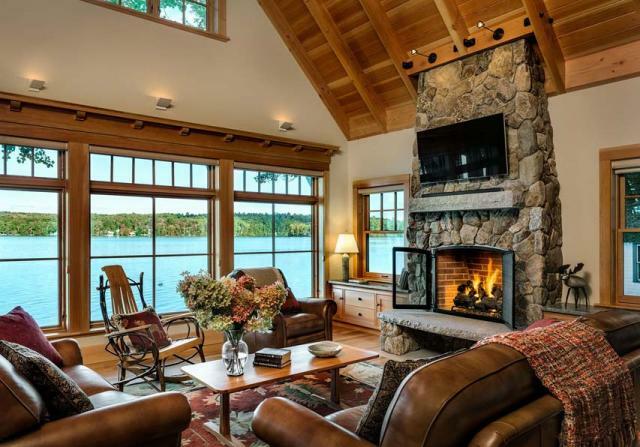 The cottage’s interior is intentionally simple and somewhat spartan with the central stone fireplace and the lake being the primary focal points. The main living space has a cathedral ceiling with the kitchen located such that it becomes an integral part of the main family gathering space. 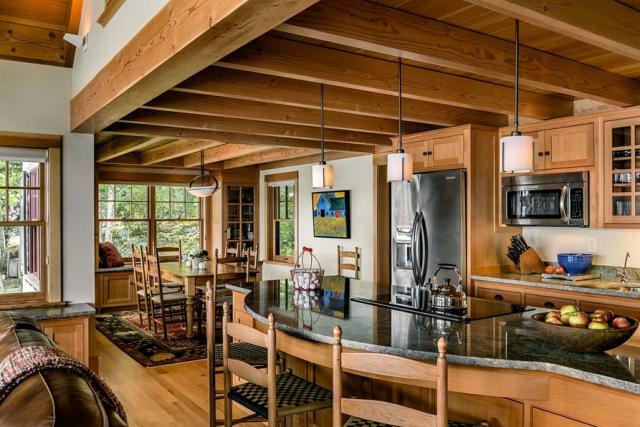 Both the living room, kitchen and dining room are contiguous spaces with beamed ceilings and cabinets constructed out of fir with a natural wood finish. The interior bedroom spaces, also utilize built-ins and natural fir ceilings to reflect the home’s casual and natural interior styling. Canoe paddle balusters, moose silhouette cutouts on the exterior shutters, and shutter brackets in the shape of airplane propellers reflect personal touches of importance to the owners. 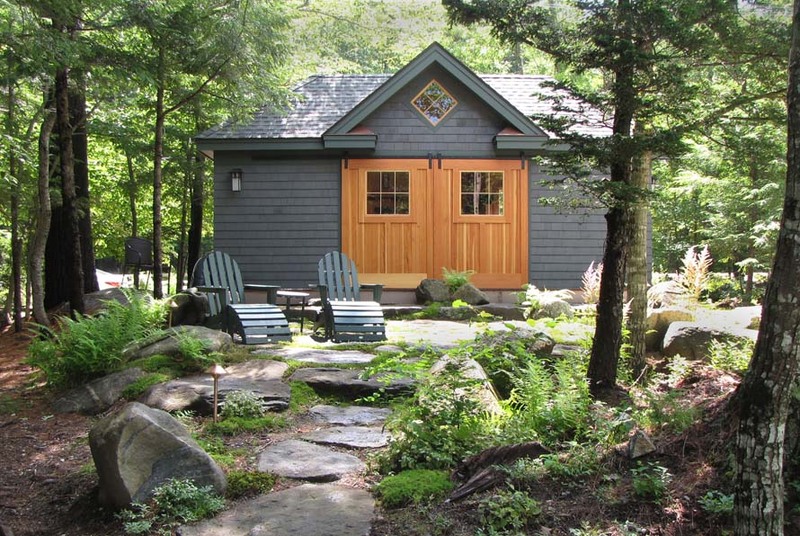 The home utilizes the most current insulation and building technologies to assure the homeowners the comfort of modern year-round living while maintaining the character of a simple lakefront Maine cottage. 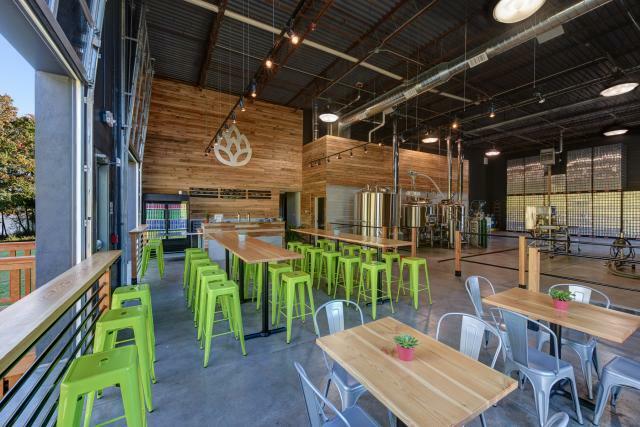 WINTER HOLBEN architecture + design, in close collaboration with Great Rhythm Brewing Company, created the entire design vision for the adaptive re-use of an underutilized waterfront industrial building to become a dynamic customer experience and state-of-the-art brewing facility. 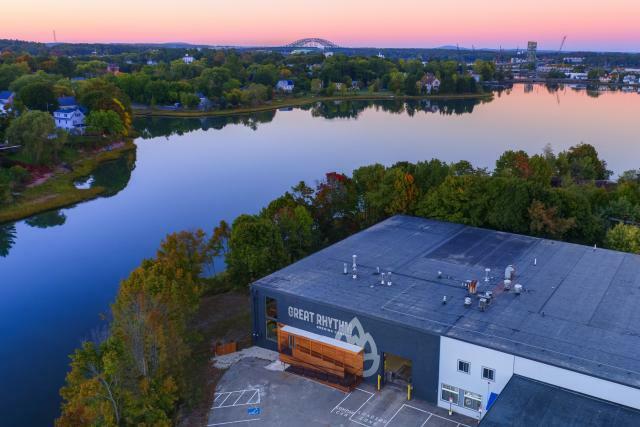 Key features of the design include; a striking presence visible from over 1200 feet away, a welcoming entrance, a tasting room with views to the outdoor environment and brew house, and a visitor destination that compliments the revitalized West End neighborhood of Portsmouth. Jury Comments: Another before-and-after project, the photos of this transformation, achieved at a modest $50/square foot, say it all. The jury commended the choices made by the architects, in every aspect of the design. 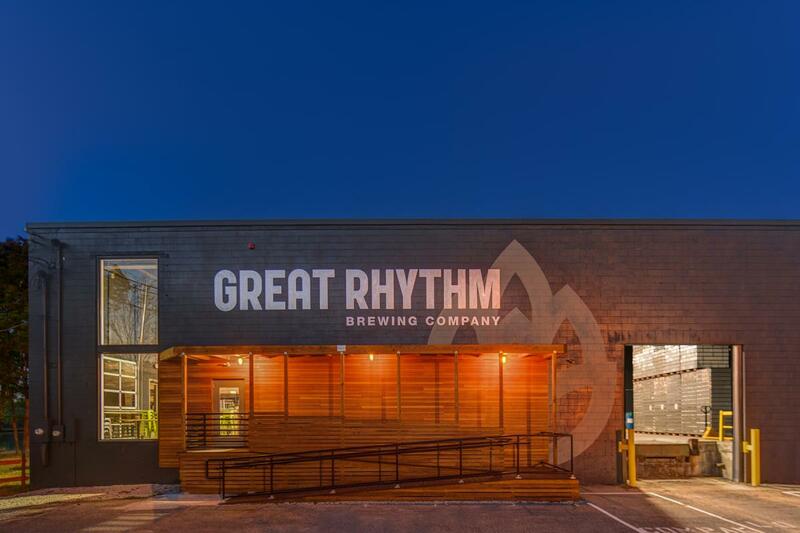 A few simple gestures on the front façade – super graphics, a wood entry box and vertically stacked reclaimed windows – create both an elegant composition and an unmistakable image for the brewery that, according to the architects, is visible from 1,200 feet away. Reclaimed wood is brought into the interior judiciously, but also monumentally, communicating across space and celebrating the high-ceilinged volume. The light colored wood and the monochromatic dark gray ceilings and concrete block also complement each other in color and texture, and add a surprising intimacy to an otherwise open volume. 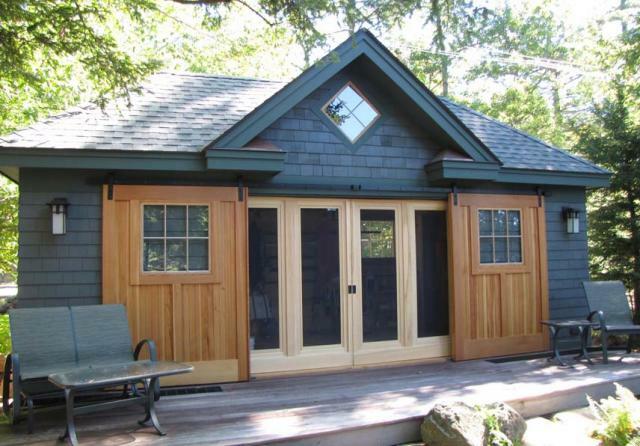 Simple garage doors, when open, provide additional dramatic effect. 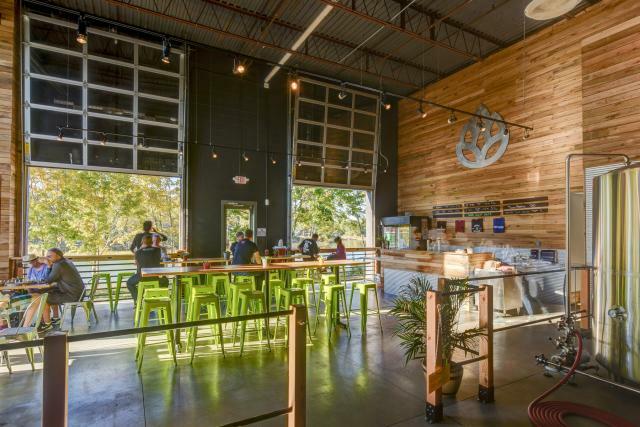 The jury commented that this looked like it would be a fun place to go, an example of how a successful design can make for a successful business. Landscape Architect: Blackwater Design Ltd. 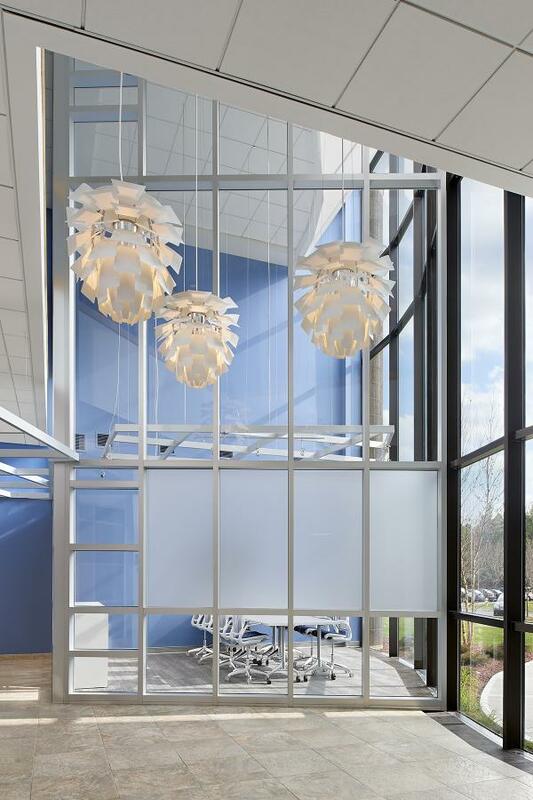 This growing international medical device manufacturer engaged Lavallee Brensinger Architects to assist in finding solutions to space needs and desire for facilities that enhance work environment and brand. 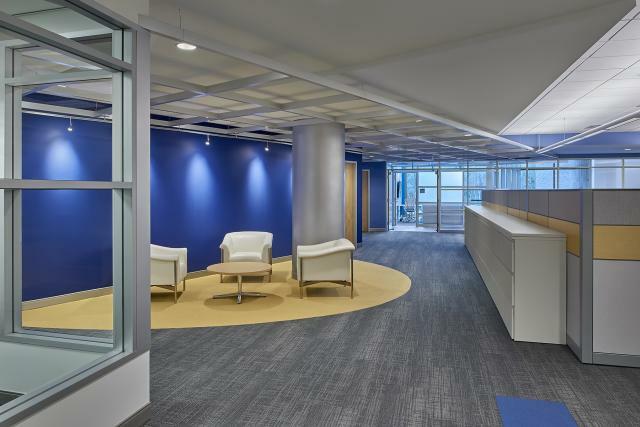 Lavallee Brensinger Architects led a feasibility study to assess the comparative benefits of possible new sites versus the adaptation and expansion of existing facilities. 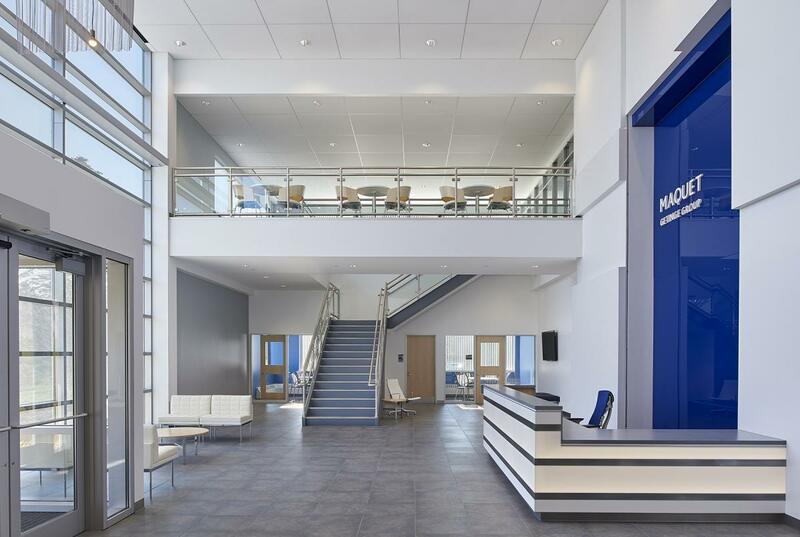 The availability of modestly priced quality office space tipped the scales in favor of existing facilities, resulting in the acquisition of an office building and site with capacity for additional development. The ultimate program includes new construction for clean room manufacturing, quality control, technical support, shipping/receiving, comprehensive renovations for R&D laboratories, main entrance lobby, food service, fitness, training, offices and conferencing. Jury Comments: The before-and-after images of the main entry to this project caught the jury’s attention immediately. 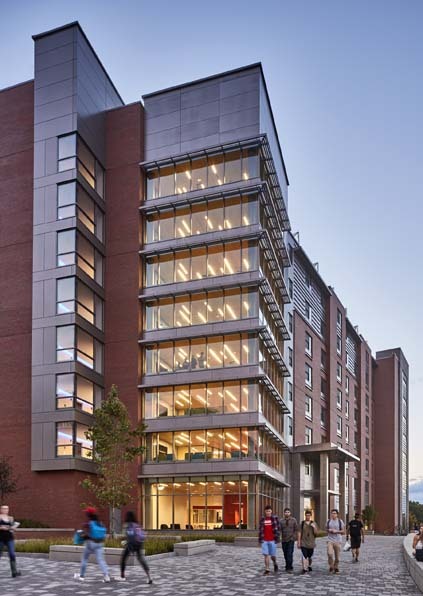 As we looked further, understanding the strategy with which the architects efficiently reprogrammed the loading dock to become the main entry, repurposed the previous main entry into a private executive entry, and then moved the loading dock to the back of the site, the jury agreed this project deserved a merit award. The crisp resolution of the new main entry, both with respect to the hardscape and the façade renovation are elegant and completely convincing. By reorganizing penetrations in the façade, reusing existing brick, and integrating thin black horizontal mullions into the new entry piece – a subtle detail that references the existing black mullions – this renovation elevates both old and new, contrasting them, without placing them in competition with each other. This same approach is carried seamlessly into interiors that are crisply organized, restrained and yet quite inviting, with plenty of natural light. This unique lakeside shelter was designed in conjunction with, and to complement a nearby family home. The program for the building is to provide secure storage for small watercraft, equipment, and beach paraphernalia as well as provide a gathering space for a large family and friends. Its geometry was controlled by the site but materials and details made the building unique. The building was very visible from the road and had to maintain a low profile to fit into the sensitive Squam Shoreline. The lake side allowed more stature as it was well sheltered in the pines and landscape. The owner’s desire was keep the land as natural as possible. Set on piers, the building spans over a large boulder on one side and the deck just kisses a larger boulder on the other. The building was sited to face the shoreline and to avoid impinging on healthy 36 inch white pines. As the Owner said: “This little area has tremendous potential to be very beautiful”, with emphasis on the word little. The building area allowed by setbacks is small enough, but is reduced by sixty percent due to a power line easement that bisects the lot. Buildable site area including overhangs was 1,790 sq. ft. less the area of large boulders and trees. Jury Comments: The first image in this presentation, from the vantage point of the stone steps, as if the visitor has just happened upon this handsome small structure, captured the jury’s imagination. The restraint of the design, with careful attention to detail, is pleasing, and the decision to depart from the otherwise monochromatic palate, in the stain of the doors, pulls the composition together subtly, giving this small structure a sense of presence. The jury was also impressed that, within extreme limitations, created by setbacks and boulders, the architect managed to site the building in a way that makes it appear to have always been there. Construction Manager: Milestone Engineering & Construction Inc.
“Cold and Bold” is the motto of the Holderness hockey program, a heritage of an outdoor hockey program that provides a distinct home rink advantage. 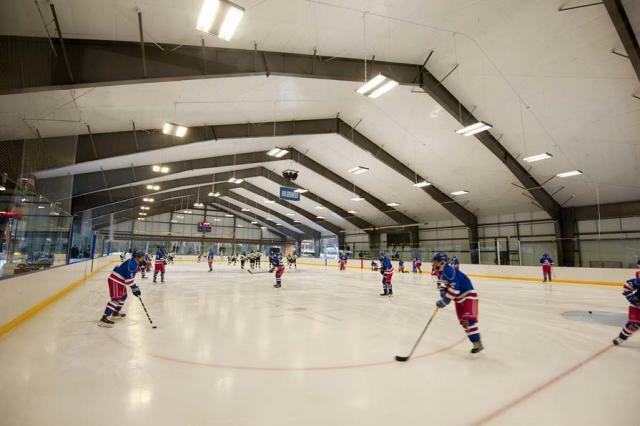 In 2014 with the existing rink roof in structural failure this private boarding school, together with their construction manager, commissioned the Turner group to provide full design services. Working as a team with owner, consultants and contractors, the group was able to demolish and construct a new rink for the following hockey season. 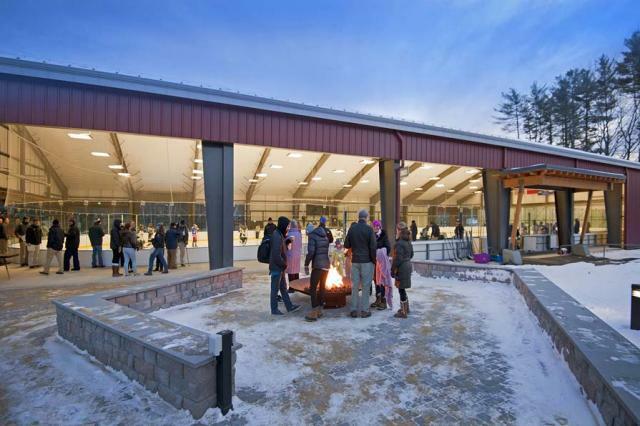 The external forces of location and climate truly shaped and determined the final design of the open rink. 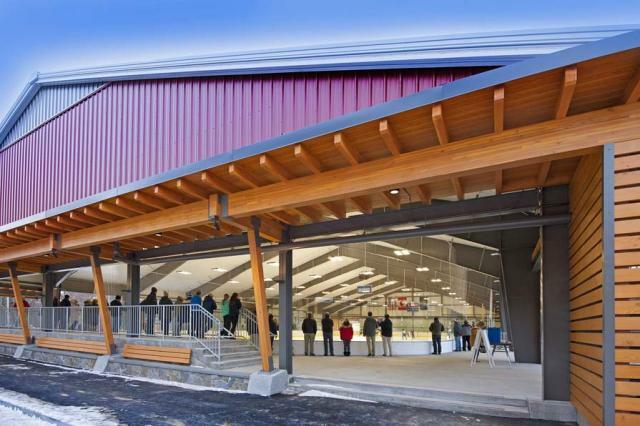 Timber frame canopies provide additional winter sun shading for the ice surface and also serve to enhance the New England character of the building. Full height northwest walls and a large sliding door shield players and spectators from the wind. The large south facing roof provides a solar array that will power the facility through the future. Jury Comments: The jury was immediately impressed with the obvious economy of means in this design. 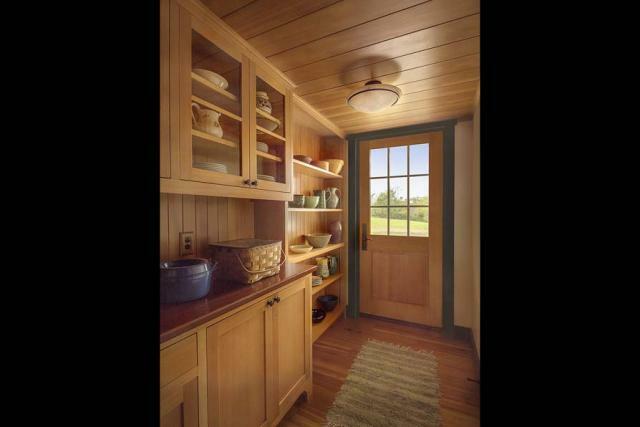 By judiciously integrating wood elements as entry features, with thoughtful joinery and base detailing, the architects have successfully transformed a straightforward pre-engineered building into a reference to rural New England vernacular architecture. The color palette, as represented in the final built form, further reinforces this theme. The jury was also intrigued with the balance of climate considerations, simultaneously orienting the building for solar gain while protecting the ice from unwanted sun, and sheltering users from the wind. It was 90 degrees in Columbia the day of the jury, but we all felt chilly reviewing this entry. NextGen Hall: a 720 bed residence hall supporting growth through Living-Learning Communities. Collaboration between various programs, faculty and staff foster innovation and community. 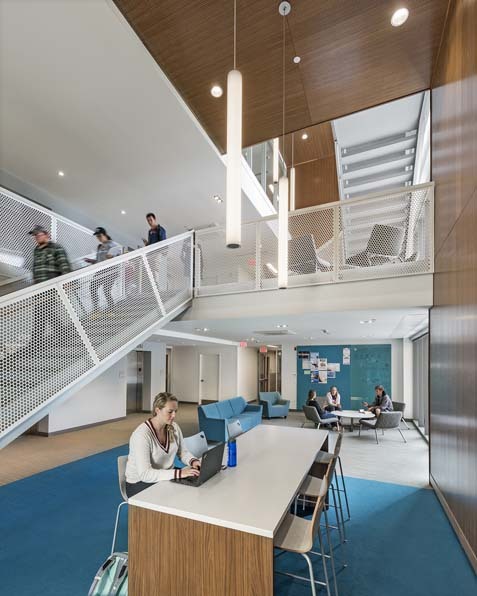 NextGen Hall contains residential spaces, offices for Residential Life and First Year Programs & Learning Communities staff, and spaces for academic success, innovation, and community building. These spaces include a Learning Community Innovation Zone makerspace, idea lab, NextGen Forum for programs and events, and dedicated community spaces for students and faculty. The building is sited at the top of the Hilltop area of campus, between existing Ellsworth and Garrigas Halls. It's massing and orientation are modulated to respond to the scale and form of Garrigas and Ellsworth though plan manipulation and wing heights. 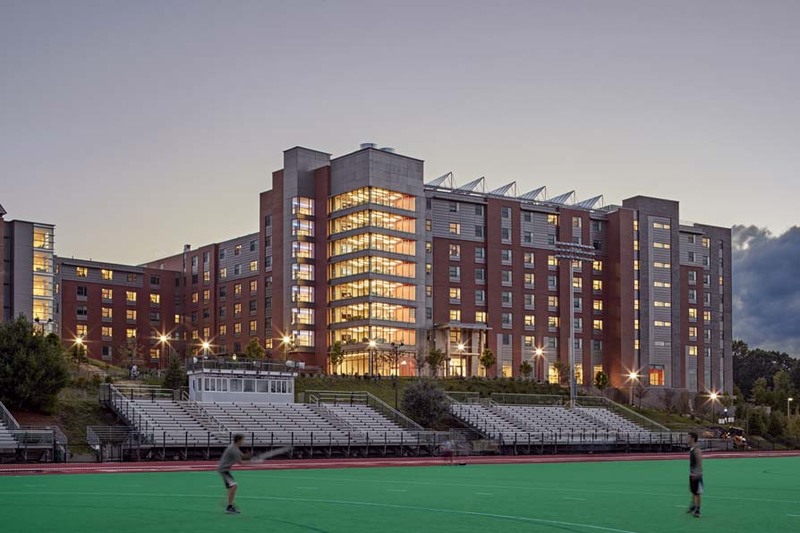 The facade is articulated to reduce the scale of the building at the pedestrian courtyard, while trumpeting the University's commitment to Science, Technology, Engineering and Mathematics from the top of the hill. Jury Comments: This project receives a citation for both its response to context and its well-organized, bright interiors. 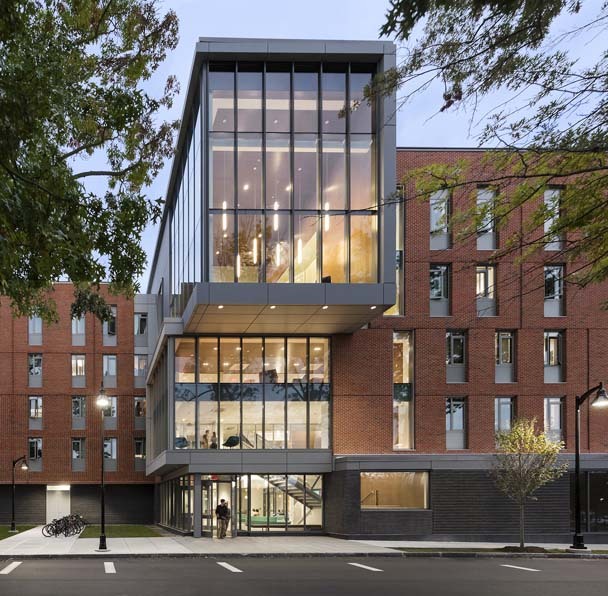 By opening up the C-shaped plan, the building sensitively addresses the residence halls to either side, approaching each with an orthogonal orientation, tying all three buildings together. The one-story gallery also successfully mediates the courtyard, bringing it down to human scale. The jury particularly praised the interiors, which were simultaneously disciplined and warm, in texture and color, and awash with natural light. We imagine that panoramas from the corner community spaces must be spectacular. General Contractor: Estes & Gallup Inc. 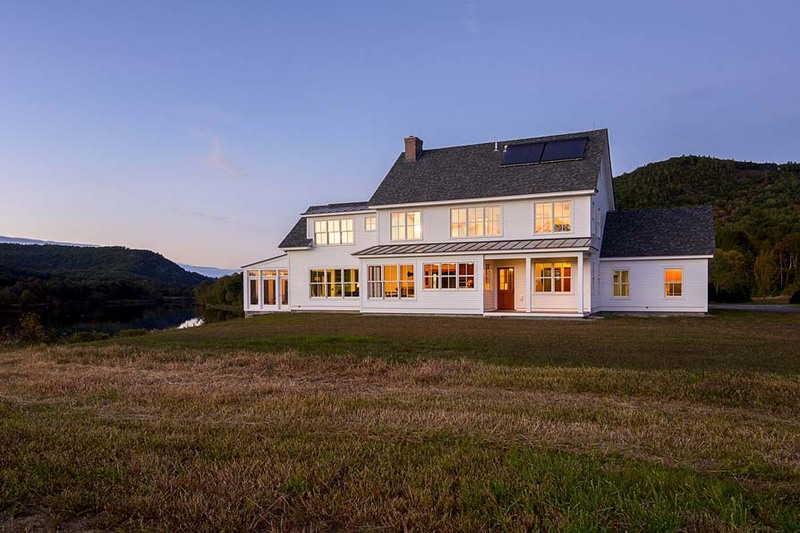 This shingle style home located at the edge of the Dartmouth College campus is sited at the top of a hill that slopes down to the Connecticut River and has views into Vermont through a screen of mature trees. The design, massing and detailing allows the house to fit into the context of early 20th century buildings and breaks down the scale of the structure. The garage doors and drive court are hidden behind the ell to minimize the impact of cars. The columned porch is a welcoming gesture to neighbors and is a response to the pedestrian character of the neighborhood. The primary rooms are organized on an east west axis that lead from public to private rooms and to outdoor spaces that overlook the river. These spaces flow together in in open plan where south facing windows maximize solar gain and sunlight and provide views into the gardens. Jury Comments: The jury’s phrase for this project was “refined elegance,” both for the project itself and, equally, for the presentation. 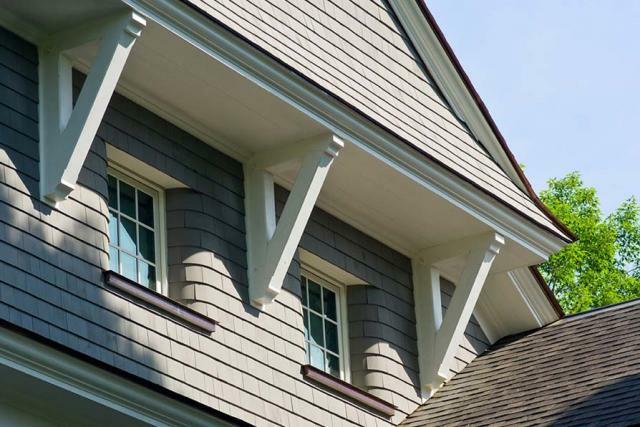 The shingle-style language chosen by the architects appears appropriate for the context, and great care has been taken to maintain a rich, well-articulated stylistic consistency throughout the design. The jury was impressed with the restraint exhibited by the architects, both on the exterior and in the interior spaces. 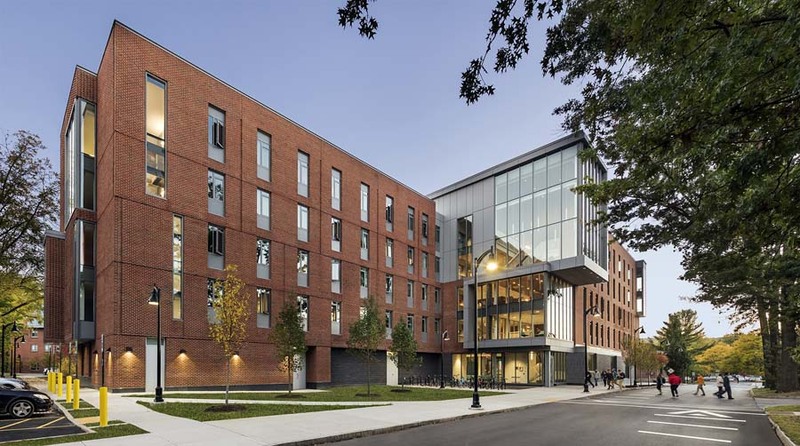 The flow and organization of the floor plans, siting of the various structures, and exterior massing and detailing give the impression that the architects are avid students of the architecture of McKim Mead & White. Special recognition also goes to the contractor for excellent craftsmanship. This home’s meticulous renovation restored the exterior and breathed new life into the interior. Dark, small interior spaces were re-imagined to accommodate a brighter, active lifestyle with frequent gatherings. The homeowners can now accommodate overnight visitors and created space allows flow for frequent entertaining. The main hall was restored with traditional detailing and bright colors. The existing kitchen was relocated to the front of the house to create connectivity between bustling kitchen activity and the front porch with street views. 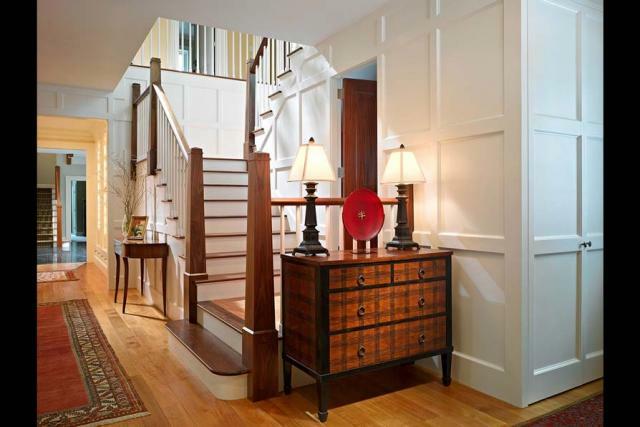 Upstairs spaces were modernized and enlivened to accommodate visiting family members and friends of ranging age groups. The home’s infamous exterior shingles were given a wash of a unique, bright color unlike any other in the neighborhood. A dilapidated rear porch was remodeled into an outside living space with a simple screen system and intricate interior detailing. Overgrown landscaping was cleared to allow the building to be viewed.